The Government's own studies reveal that every form of Brexit will leave our country worse off. There is no Brexit dividend, only Brexit cost. Do you trust our government to make the right choice for you? 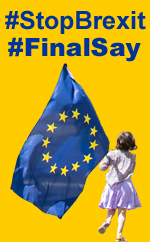 If the answer is NO, then you need to sign up to (and share with your friends and family) the Peoples Vote campaign, to ask the people if the negotiated deal is what they actually want, or whether, after considering the facts in front of them, they would actually prefer to remain in the EU. It's the only democratic option. Write to your MP now. 1) Labour official policy is to propose/support a second referendum on the Brexit deal with an option to remain, now that their alternative proposals (a sort of Norway/Unicorn mash-up) have been rejected by Parliament. Is everyone singing off the same hymn sheet? We shall see. 2) Theresa May, with her now almost unfailing ability to see off a rebellion in the making, promised on Tuesday to hold another meaningful vote on her Brexit deal on 12 March. If that fails to pass, MPs will be given a vote on leaving with no deal and, if that also fails, on extending article 50 beyond the 29 March departure deadline. 3) Yvette Cooper was, understandably, unwilling to take Theresa May's promised sequece of votes on trust. Her amendment, holding May to her promise re the extension, passed with a thumping majority. Anne-Marie Morris MP (Newton Abbot) was one of 20 ERG MPs to vote against. She, it seems, would relish no deal and the pain it would cause. 4) We now know for sure that, whatever May says, we are in no way prepared for a No-Deal crash out. The summary document Anna Soubry managed to secure seeks to blame business for failing to spend a small fortune on preparations for a self-inflicted catastrophe. Only 40,000 of 240.000 businesses who deal extensively with the EU have registered for customs formalities. Who can blame them? May's blackmail Brexit needs to be seen clearly for what it is. We remain outraged by the refusal to just take it off the table. Regarding the extension, the EU have always made it clear that there would have to be a very good reason - another vote or a GE - for an extension to be granted. Macron has stressed that again today. No more can-kicking. 5) There was one ray of sunshine that actually reached the House: Alberto Costa's amendment went through 'on the nod. It calls on the government to implement the part of the withdrawal agreement that includes citizens’ rights at “the earliest opportunity” regardless of the outcome of negotiations. So what happens next? There are rumours that her deal will come back to Parliament this week and that the ERG will back it, thus removing the obligation for votes on No Deal and extension. We are not out of the woods, yet, and must keep up the pressure. May's Withdrawal Agreement is, effectively, a blind Brexit and if the ERG got their hands on it, could turn very nasty indeed AND the possibility of crashing out 'by accident' remains. That must not be allowed to happen. Fortunately, there are 'woke' MPs who can see the traps and will take steps to avoid them. We have to keep up the pressure on MPs for a public ratification vote and that means they must support any amendment to make acceptance of May's deal conditional on the public giving their informed consent. Keep writing. It works!